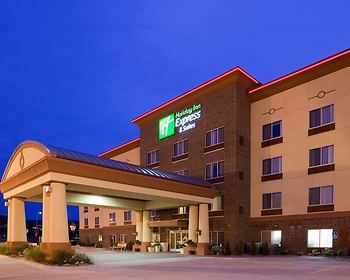 Hotel Holiday Inn Express & Suites Winona, Winona, United States of America - Lowest Rate Guaranteed! Located in Winona, Holiday Inn Express & Suites Winona is a 2-minute drive from Sugar Loaf and 5 minutes from Lake Lodge Recreation Center. This hotel is 1.9 mi (3 km) from St. Stanislaus Kostka Basilica and 2.4 mi (3.8 km) from Polish Cultural Institute & Museum Annex. Clean and very well maintained. Staff was very helpful and accomodating! Our room was quiet and comfortable... although it would be nice to have some counter space to put an ice bucket, glasses & snacks. Do any hotels use plain old flat pillows like an average person has on his own bed? Everything was very nice! Bed was comfortable. We enjoyed our stay. It was a great location to the wedding we were attending. The hotel had great amenties, hot tub, sauna, breakfast. The rooms were very clean, new like, and we thought it was great. We did not bring our kids; however, we thought they would of loved the pool. We will keep it in mind in the future, should we return to Winona again. Thanks. Logos, brands, and other trademarks featured within this site are the property of their respective trademark holders. These trademark holders are not directly affiliated with Hotelsone. Holiday Inn Express Hotel is a registered trademark.© 2001 - 2019 HotelsOne. All rights reserved.